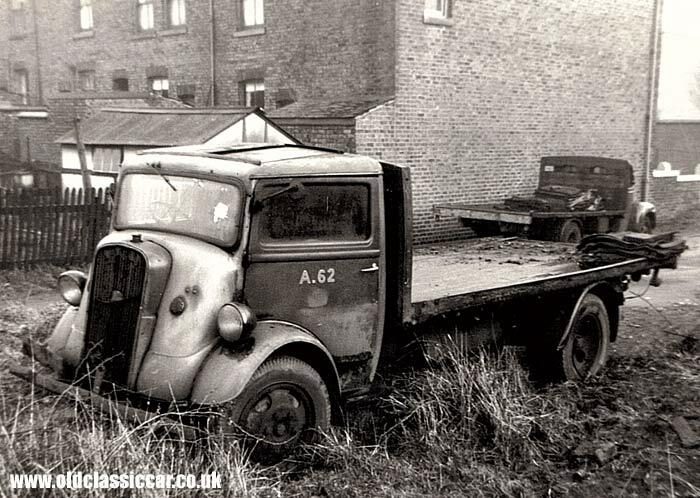 A derelict Fordson 7V coal lorry, plus a printer's van. Homepage. This page: A sad-looking Ford coal delivery truck, and an immaculate 7V van. Paul kindly agreed to this photo being shown on the site. It shows a semi-abandoned Fordson 7V lorry, with flatbed body, parked on a rough bit of ground and looking very neglected indeed. Sadly the registration number isn't visible, so its identity will remain a mystery. A later Fordson, possibly a 4D or ET6, can just be made out in the background, again it looks like a lorry on coal duty. As with most commercial vehicles, once their working life is over they are swiftly replaced, and rarely do their owners get sentimental about the lorry being replaced. This Fordson looks like it may have reached the end of the road. The forward-control 7V range made its debut in 1937, powered by a 30hp sidevalve V8 engine. The distinctive boxy cab featured a sunroof over the passenger seat, and is clearly visible in the photograph above. A four speed "crash" gearbox, and a torque tube, delivered the drive to the rear wheels. Two different wheelbases were offered in the standard lorry range, each available in either 2 or 3 ton capacity. Someone desiring a van could opt for a 2 ton 7V utilising a shorter chassis, and larger six wheelers were also available. In 1938, the 7Vs were marketed by Ford either as Fordsons or as Thames lorries, depending on which brochure you picked up at your local agent, with 4 and 5 ton versions being introduced the following year, as were all-new tipper versions. Both short- and long-wheelbases were available. The earlier 7Vs are identifiable by the large headlamps, as fitted to the lorry above. Early 7Vs, built in 1937 and 1938, had a curved radiator grille, whereas those from 1939 onwards had a flatter affair, mounted between smaller, wartime-spec headlamps. Production of the civilian 7V continued throughout the war, many of the tippers being pressed into service clearing up after the bombing raids, and then delivering raw materials to areas being rebuilt. Once hostilities had ceased, production continued with the 7V range, soon to be identifiable thanks to the placement of a new Fordson badge on the grille. Numerous revisions were also introduced as peacetime production settled down, not least an all-new braking system, and later still a new articulated version of the 7V, with a fifth wheel coupling. Production of this model continued until 1949. 2. An immaculate 7V van. 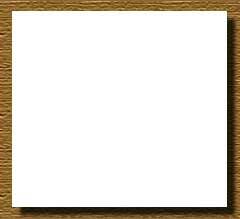 "I am currently researching my family history. 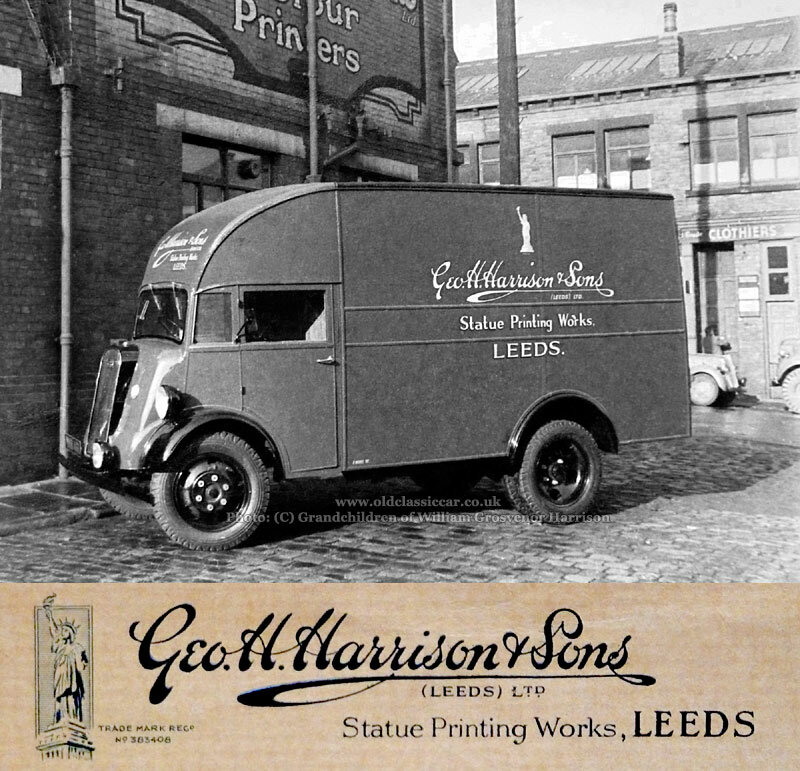 My Great Grandfather George Holroyd Harrison (1872-1928) founded printing company Geo H Harrison's & Sons in Leeds, Yorkshire (at the Statue Printing Works). The firm was then passed down to my Grandfather and two Great Uncles, and it ran until 1971 when it ceased trading." Part of her reseach involved identifying the van shown in the following photograph. 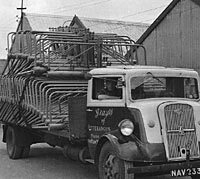 It's another example of the Fordson 7V, albeit in much better condition than the flatbed lorry shown in Paul's photograph above. I can't quite make out the registration, but I think it's probably a post-war example. Parked in the background is a car - perhaps a late 1930s Standard - while just visible to the right of shot, appears to be an ex-military vehicle - a WW2 Dodge? 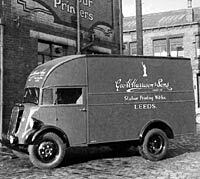 The Fordson is very clean and could well be new at the time of the photograph being taken, just after the signwriting for Geo. H. Harrison & Sons (Leeds) Ltd had been applied. The van body was probably built by a third-party coachbuilder (ie not by Ford themselves), utilising a rolling chassis that also included the front end panels - to just above the screen - purchased from a Ford sales agency. This was common practice, the bodywork being built to suit a specific purpose on behalf of the vehicle's first owner. A close look at the grille reveals both Fordson and Thames badging. Thanks for the photo Diane. 3. 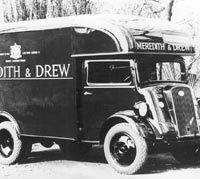 Meredith & Drew 7V biscuit delivery van. Judging by its condition, this 7V delivery van was probably newly-built at the time of this photograph being taken. It hasn't even been registered for the road as yet. It's finished in the signwritten livery of Meredith & Drew, biscuit manufacturers, by appointment to the late King George V. He died in 1936, and the 7V range was introduced the following year, in 1937. Note the new, diamond-pattern, tyres fitted to all four corners of the van, and both Fordson and Thames badges installed on the upright radiator grille. 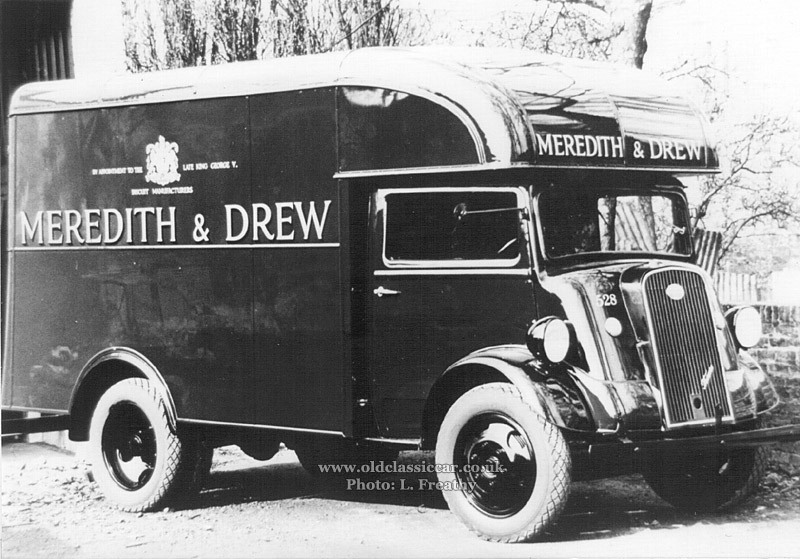 Meredith & Drew entered the biscuit-making business in 1830 and, in 1948, moved into crisp production. Nineteen years later, in 1967, the firm was taken over by United Biscuits. 4. A 7V belonging to Grays of Fetterangus. Credit for this photo turning up goes to Henry Pirie, over the last few years he has sent over a number of photographs. 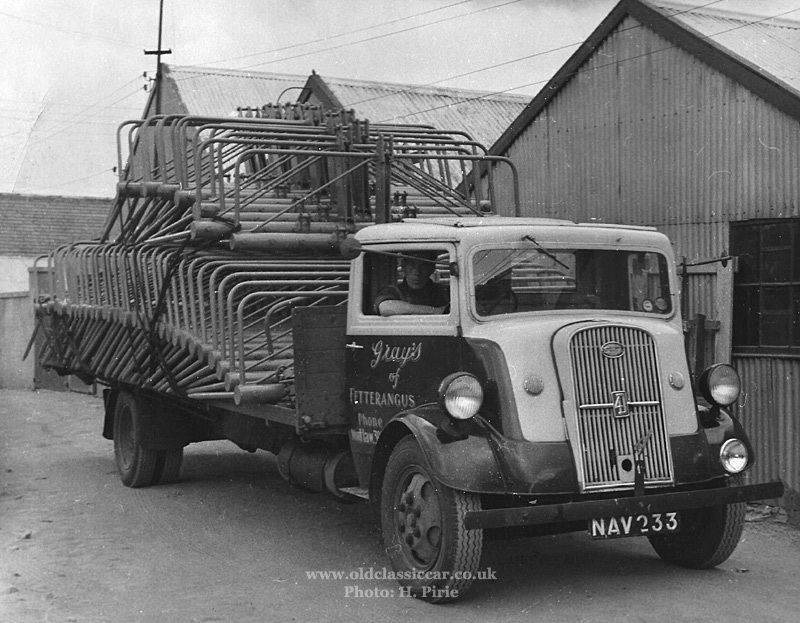 Here we see a well-worked 7V lorry belonging to Grays of Fetterangus, a company who specialized in the manufacture of agriculture machinery in Aberdeenshire (hence the NAV 233 registration). Oddly the 'NAV' registration series was introduced in 1956 yet the lorry is somewhat older than that. Perhaps it is ex-military? The radiator grille sports badges for Fordson, Thames, and another reading "4D". The latter badge suggests that the diesel engine from a later ET6/4D series Ford had been retro-fitted to this particular 7V. The angle of the nearside headlamp suggests that it was more useful in illuminating overhead signs, than the road ahead of it. Many thanks for the photo Henry, it's always neat to see in-period photographs of these old lorries in their heyday, grimy and weathered, rather than in super-shiny restored condition. The company also ran a fleet of Ford Thames 4D lorries. A photo of several of them, plus a couple of 7Vs for good measure, can be found on the Ford/Thames 4D/ET6 photo page. Return to Old Motoring Photos Page No. 9.